So we did and look, here we are! I will simply start the spring with this simple shot, taken Sunday night after an amazing weekend of lots of sun, lots of bike riding, an amazing amount of time outside in real outdoors at two separate farms (here in a city, which just makes them so cool!). There was one *slight* incident where a very irate man downtown screamed at us at the top of his lungs, "Look at you, you absolute R*TARDS!" clearly disagreeing with our choice to bike with our children on city streets, which left me both shaking and fuming, but P let roll of his back. But let's not dwell on that. 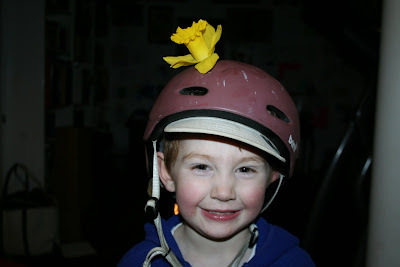 Instead, we'll focus here on the positives: the flowers are just starting to bloom, and we saw loads of folks out on bikes, and my youngest decided that my helmet needed just a bit of flourish to celebrate the new season. 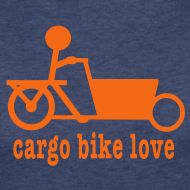 You've gotta check out People for Bikes. No matter how small I make it, the video still gets cut-off on the right.